In Windows, you can free up some space by running the Disk Cleanup tool. It will remove temporary Internet files, old setup files, and other miscellaneous files taking up space. The Windows XP version of the tool also offers you the option to Compress old files that haven’t been used lately to free up more space but it just doesn’t seem worth it. Decompressing those files later when they are needed can take more time than you gain. Another negative is that calculating the space for compressing old files when running a disk cleanup can take some time or even hang. To be able to run the Disk Cleanup tool without the option of compressing old files, it just takes a simple Registry change. 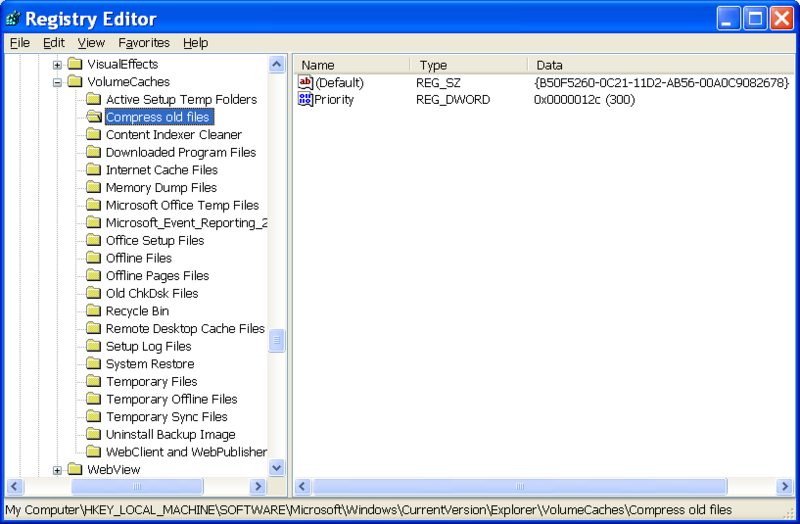 In the Registry Editor, go to HKLMSoftwareMicrosoftWindowsCurrentVersionExplorerVolumeCaches and backup/delete the ‘Compress old files’ key. After that, you can run Disk Cleanup like normal (right-click on the drive under My Computer and select Properties) and it will bypass the calculation for file compression and speed the process up quite a bit. To make it even easier, Microsoft has a FixIt tool that will resolve the issue with only a few clicks under the related Knowledge Base article.